Spanish Curly Top is a stoechas Lavender that has ruffled curly bracts on top with dark purple flowers. The Lavender flowers are a bright electric purple that really catches your eye as they sit at the top of 6 inch stems. Spanish Lavenders will bloom almost continually over the growing season and pruning regularly will help to maintain a pleasing shape and encourage abundant flowering. This Lavender is a fantastic plant for your water conserving landscape. Hardy in US Zones 7 - 10. Spanish Curly Top Lavender is a bit more tolerant of cold than other stoechas varieties. 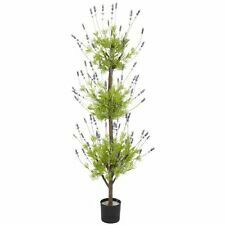 Plant in full sun in well drained soil giving adequate growing space for this medium sized (24-30 inches tall and wide) Lavender plant.